Detox start here: get the emergency big pyjamas out of the press. 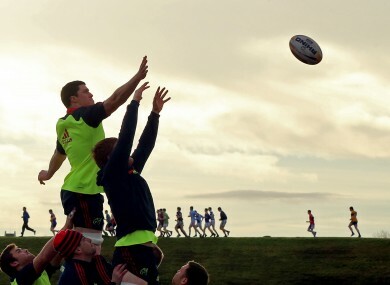 General view of the Munster forwards practicing a line out at UL. One to watch: Barcelona v Espanyol. Why not… it’s a derby as La Liga and Tito return? One to Sky+: There’s plenty of lovely play-off action in the NFL to tape if you’re watching the return of Borgen on BBC4 tomorrow. One to skip: Bit early in the year for golf, amirite? Basketball: NBA, Miami v Chicago, (ESPN, 12.30pm). Cricket: Test, South Africa v New Zealand, (Sky Sports 1, 8.25am); Australia v Sri Lanka, (Sky Sports 1, 11.25pm). Football: npower League One, Walsall v Portsmouth, (Sky Sports 1, 7.30pm). Golf: The Tournament of Champions from Hawaii, (Sky Sports 3, 11.30pm). Rugby: RaboDirect Pro12, Ulster v Scarlets, (BBC Two, 7pm); Leinster v Edinburgh, (TG4, 7.15pm); Aviva Premiership, Worcester v Leicester, (ESPN, 7.30pm). Tennis: Shenzhen Open, (ESPN, 6am); Brisbane International, (Eurosport, 9am); Qatar Open, (Eurosport, 1.30pm). Athletics: Edinburgh Cross Country, (BBC1, 1pm). Basketball: NBA, Atlanta v Boston, (ESPN, midnight). Football: FA Cup third round, Brighton v Newcastle, (ITV1, noon); West Ham v Manchester United, (ITV1, 4.30pm); Spanish Primera Division, Deportivo La Coruna v Malaga, (Sky Sports 1, 6.55pm). Golf: Tournament of Champions from Hawaii, (Sky Sports 4, 10.30pm). NFL: Houston Texans at Cincinnati Bengals; Green Bay Packers at Minnesota Vikings (Sky Sports 1, 9pm). Rugby: Aviva Premiership, Exeter v Northampton, (Sky Sports 1, 2.30pm); RaboDirect PRO12, Munster v Cardiff Blues, (S4C, 7.10pm). Tennis: Brisbane International, (Eurosport, 9am, ESPN, 4am); Qatar Open, (Eurosport, 2.30pm). Darts: BDO World Championships, (BBC1, 2.30pm, BBC2, 4.30pm, ESPN, 6.30pm). Motorsport: Dakar Rally, (Eurosport, 6pm). Cricket: ODI, India v Pakistan, (Sky Sports 1, 6.25am); Test, South Africa v New Zealand, (Sky Sports 4, 8.25am); Australia v Sri Lanka, (Sky Sports 2, 11.30am). Darts: BDO World Championships, (BBC2, 12.55pm, ESPN, 6.30pm). Football: FA Cup third round, Swansea v Arsenal, (ESPN, 12.30pm); Mansfield v Liverpool, (ESPN, 3.45pm); Spanish Primera Division, Real Madrid v Real Sociedad, Barcelona v Espanyol, Mallorca v Atletico Madrid, (Sky Sports 2 from 3.55pm). Golf: Tournament of Champions from Hawaii, (Sky Sports 3, 10.30pm). NFL: Indianapolis Colts at Baltimore Ravens; Washington Redskins at Seattle Seahawks (Sky Sports 1, 5.30pm). Rugby: Aviva Premiership, Wasps v Bath, (Sky Sports 1, 2.45pm).